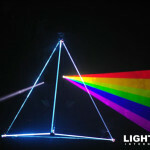 Recipient of First Place International Laser Display Association Award for live stage performance! 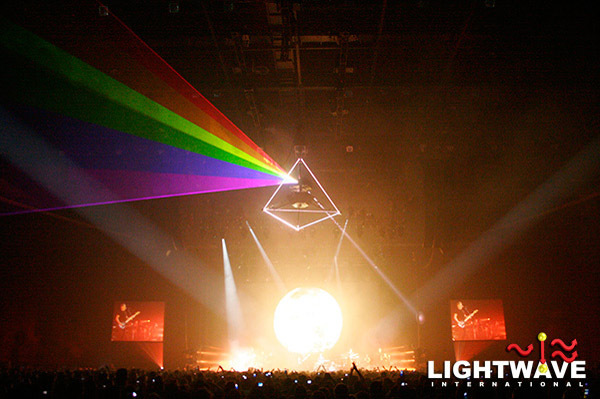 The world's largest full-color lasers re-created the iconic Pink Floyd prism in laser light. Recipient of First Place International Laser Display Association Award for live stage performance! 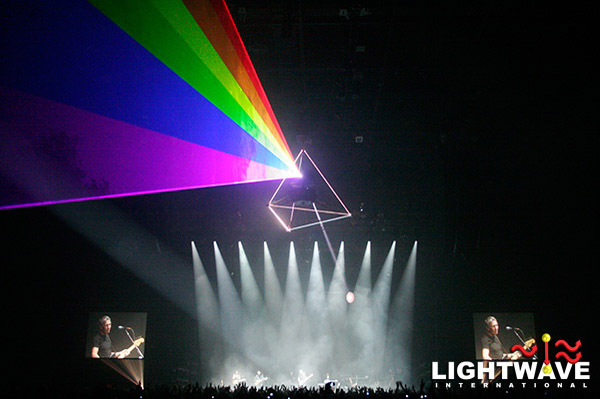 The world’s largest full-color lasers re-created the iconic Pink Floyd prism in laser light. 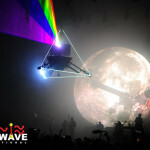 Marc Brickman transforms the famous cover artwork from “Dark Side of the Moon” by Storm Thorgerson as a laser art form. 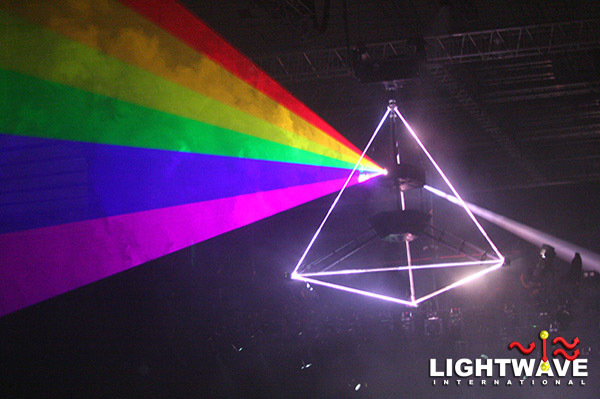 Over 100 Watts of full color lasers were used to ‘magically’ transform an abstract set piece into a rotating tetrahedron towering above the audience. 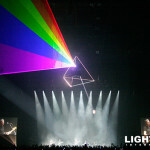 There, it rotated and emitted Pink Floyd’s famous white beam and rainbow. 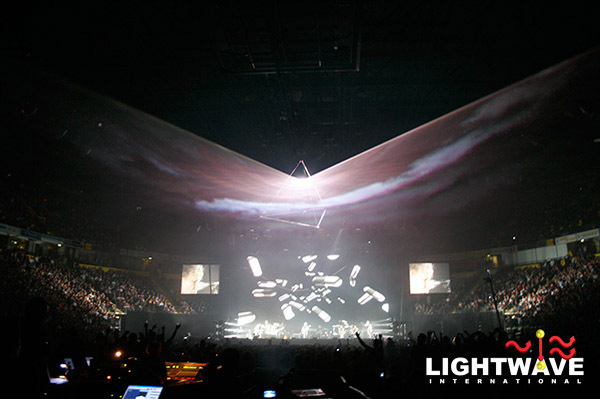 One of the main goals for this production was to dramatically reveal the prism – therefore, the structure could not resemble a pyramid until activated. This prevented the use of traditional light sources such as LED or neon. 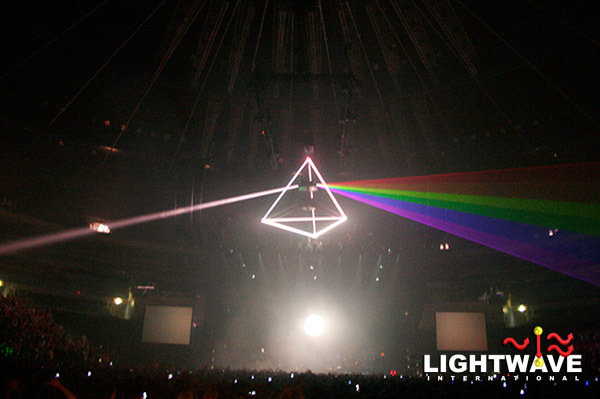 In fact, lasers were essentially a means to an end – the effect was never intended to look like a laser show. 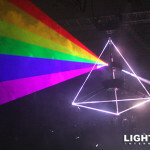 The prism was used during “Any Color You Like” for broad laser waves that transformed into the dramatic prism reveal during “Eclipse”. 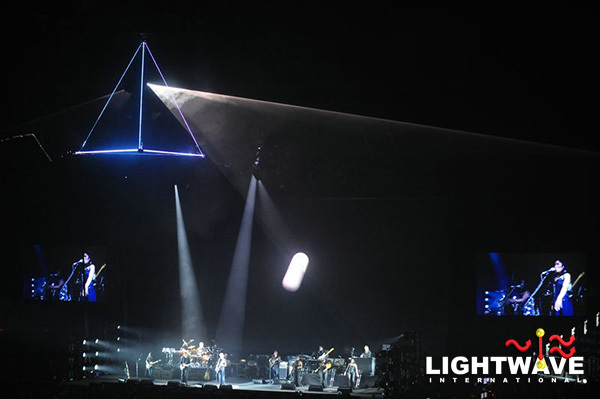 The pyramid itself was sculpted from beams of high powered RGB direct-diode lasers which formed the prism by following a series of mirrors. 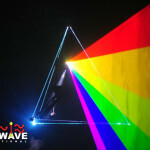 The white beam and rainbow were formed by two additional RGB systems. 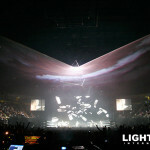 The entire structure was modular and designed to reconfigure for venues of different sizes. 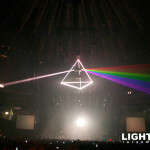 The prism could be assembled as a 12’, 16’, or 20’ version, depending on the venue. 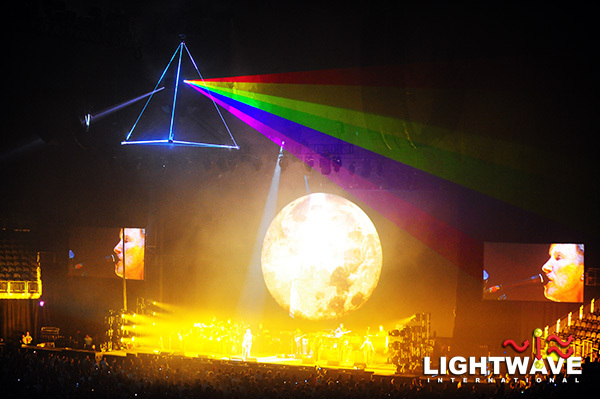 Laser power exceeded 100 Watts, and the unit was comprised of 5 Lightwave Prism Series lasers – units which are manufactured Specifically for Lightwave by Arctos in Germany. 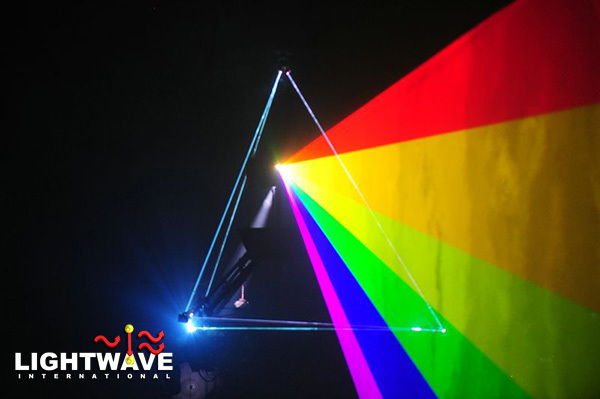 Lightwave International is the exclusive distributor of these laser systems for all of North and South America. The entire structure rotated under DMX control and passed data and power through a massive 36-conductor military slip ring system. Climate control in the top rotational housing passed regulated air through the rotational core to each of the laser housings. 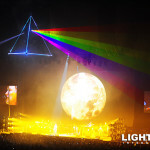 Thus, the lasers were weatherproof in all of the climates they encountered on tour: from deserts to tropical rainforests and frozen northern climates. Most often, the unit was suspended 90-120’ in the air by massive cranes. 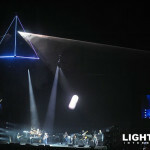 The unit included a rotational encoder that could resolve the prism’s angular position to within a few thousandths of a degree. This information was used to provide operator monitoring, speed, and the ability to serve frames based on rotational position. This allowed for effects to follow features in various venues with straightforward programming on site. 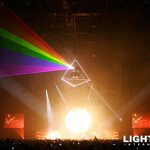 The prism was controlled by two redundant Lightwave DMX laser media servers and a custom grandMA definition. This allowed for rapid programming in a familiar lighting console environment. The system was designed for rapid tour deployment, and thus all the electronics and lasers rode inside the metal housings for the duration of the tour. Highly rugged and reliable solid state technology was essential to this time saving step, and of course reduced the power budget from many hundreds or thousands of kilowatts to a few thousand, while also negating the need for any water cooling. The Prism returned in 2008 with power and performance upgrades, as well as direct haze injection for guaranteed outdoor visibility – even when hanging from 135m cranes. 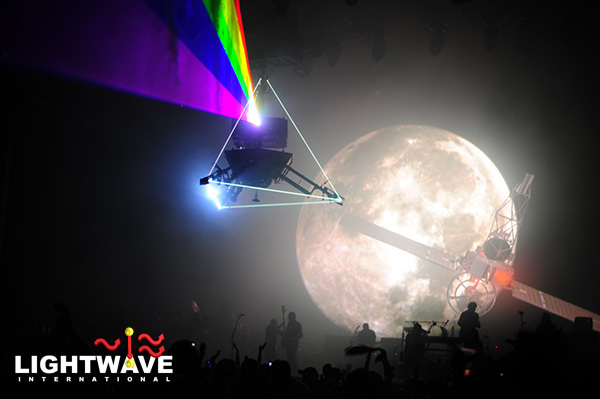 Only two touring technicians were needed to build and operate this massive laser effect; a tribute to the simplicity and reliability of modernized equipment. The effect has successfully toured: Europe, South America, Mexico, Canada and the United States spanning two years. 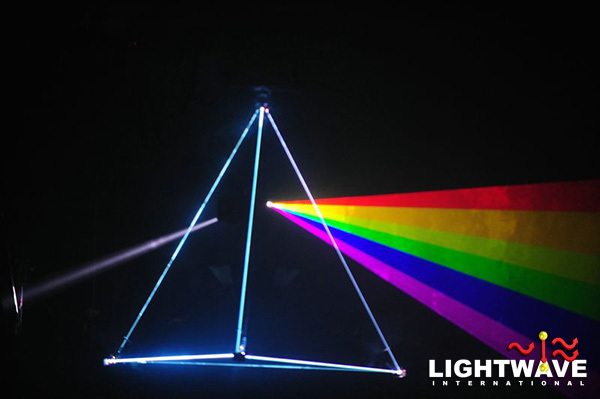 The prism was recognized by the International Laser Display Association and awarded First Place in the 2009 ILDA Awards under the Live Stage Performance category.